Give your home a fresh makeover with the elegant Glass Mosaica Travertine Marble Mix tile. 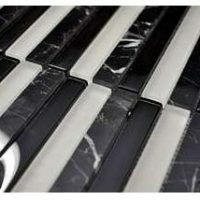 It boasts of a fantastic design which includes multiple stripes of black, grey and brown mosaics. 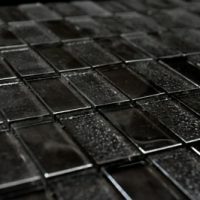 The Glass Mosaica Travertine Marble Mix tile is available in a standard size of 303x303mm and is sold per piece. It is an indoor wall tile which is ideal for use in bathroom and laundry walls, as well as in kitchen splashbacks. It can also be used in feature walls or for creating wall borders. 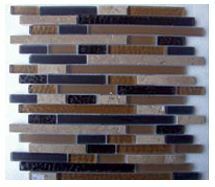 This mosaic offers an excellent blend of practicality and great looks. 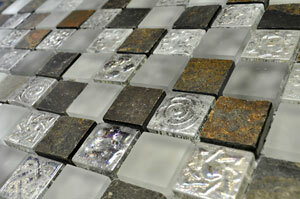 The decorative looks are thanks to an eclectic mix of gloss glass, stipple glass and polished stone. It can be cut smaller into 2, 3 or 6 strips and will still retain its interlocking edges. This allows for a modern finish. For an affordable mosaic, the Glass Mosaica Travertine Marble Mix rivals many superior grade tiles in the market. Thanks to special design and high-quality manufacturing, it is built to withstand the test of time. If you’re looking for elegant mosaics in Perth, look no further than the Glass Mosaica Travertine Marble Mix tile at Ross’s Discount Home Centre. Buy this mosaic for your home renovation today!